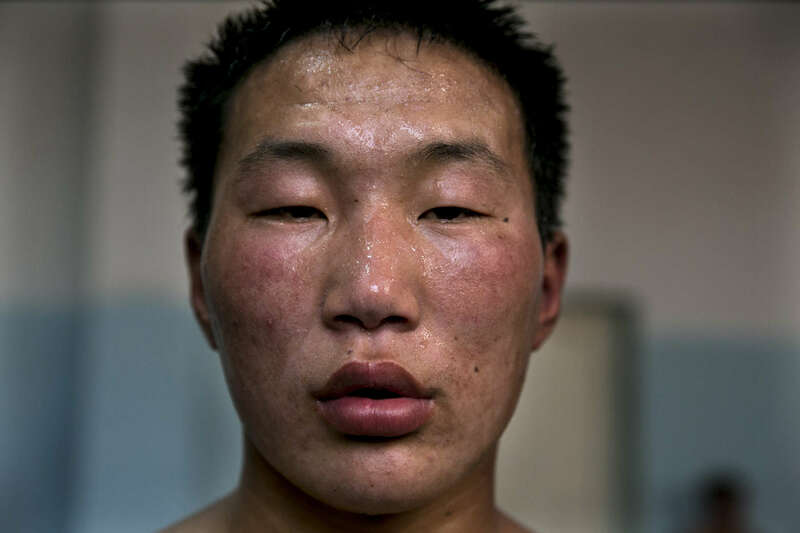 A Mongolian wrestler looks into a camera during a break in wrestling practice. Mongolia is the most sparsely populated country on earth, but its people are some of the strongest. In Mongolia, wrestling is the most important sport that runs deep into its culture along with horsemanship and archery. Going back for hundreds of years, history books tell the story of how Genghis Khan considered wrestling to be an important way to keep his army combat ready while back in the Qing Dynasty (1646–1911) regular wrestling events were held. In Mongolia’s capitol city, Ulan Batar is home to many wrestling schools where almost daily you can see dozens of young men sweating in crowded gyms while in schools both girls and boys are taught some wrestling techniques.